Hands All Over is the third studio album by the American pop rock band Maroon 5. Produced by veteran producer Robert John "Mutt" Lange, the album was released by A&M/Octone Records on September 21, 2010. On July 12, 2011, the band re-released the album to include their summer hit "Moves Like Jagger". The lead single, "Misery", was released in June 2010. "Give a Little More" followed as the second single in August 2010, "Never Gonna Leave This Bed" as the third single in January 2011, and "Moves Like Jagger" as the fourth and final single in June 2011. The album received generally mixed reviews from music critics, though many of them praised it for its production. Some critics have noted that the album features more of a soulful style than Maroon 5's previous works. 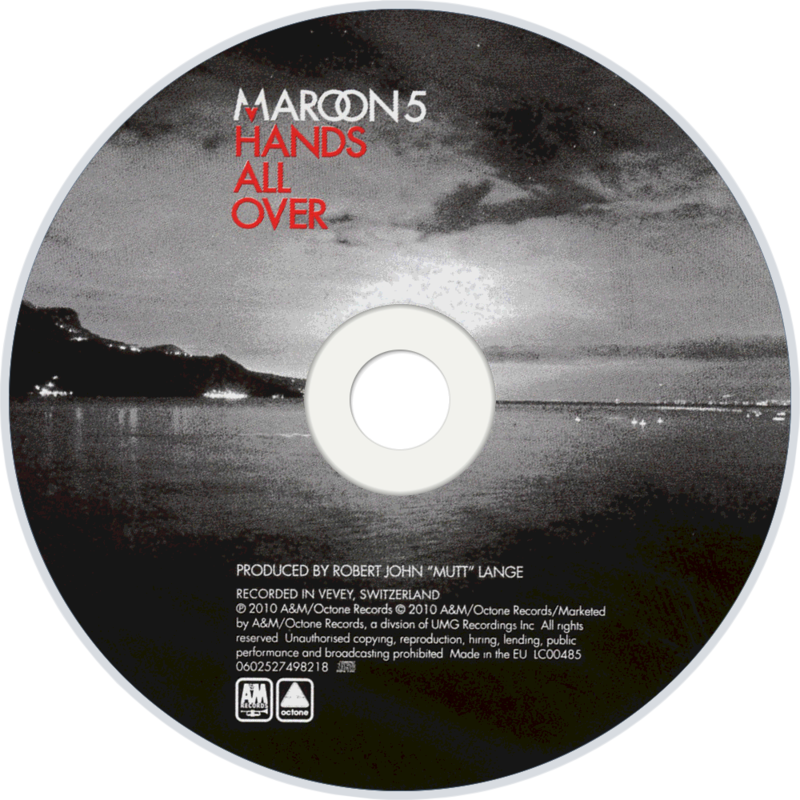 Maroon 5 began writing the songs that appear on Hands All Over after winding down from a world tour in support of their 2007 studio release It Won't Be Soon Before Long. Several months later, the band received a phone call from Robert John "Mutt" Lange, who had heard that the band were beginning to write a new album, and expressed an interest in producing it. In a press release on their official website, the album is described as "a killer hybrid of rock, pop, funk and R&B." In an interview with Rolling Stone, the band revealed that they spent two months writing and recording their third record with producer Robert John "Mutt" Lange in his recording studio in Lake Geneva, Switzerland. Maroon 5 lead singer Adam Levine, spoke about the experience of working with Lange: "He worked me harder than anyone ever has," "I would come in with a finished song, and he'd say, 'That's a good start. Now strip it down to the drums and start over.' The coolest thing about him is that not only has he been a huge, legendary producer, but he also is a legit, serious writer." Rolling Stone has said that the resulting disc is the band's brightest-sounding and poppiest yet and that it delivers Lange's mix of catchy hooks and punchy rhythms. Levine has also said about the album: "Our first record was a reflection of my love for Stevie Wonder. With the second I kept going back and forth between Prince and The Police. But there was no one on my mind for this album. It's just great pop." The album artwork was revealed on July 1, 2010. The cover photo for the album was taken by 19-year old photographer Rosie Hardy, who also serves as the model in the photo. Hardy took the photo herself, in just under an hour, in her own bedroom in the town of Buxton in the UK. A brief aside: Robert ‘Mutt’ Lange must have the weirdest production CV of almost anyone in the rock era. Who else has managed to make an astonishing living at the helm of worldwide hit albums from artists as diverse as Def Leppard, AC/DC, The Corrs and Shania Twain? He is, however, the perfect person to buff up Maroon 5’s lascivious pop, given that Adam Levine clearly fancies himself as something of a dirty old rock star. The album begins with a puzzle. Misery might be an accomplished pop song, a clear hit, but it’s also 90% based on a hit they’ve already had: This Love. Its provocative placement at the gateway into this album’s garden of sonic delights is clearly designed to send a message – that they’re back and just as good as ever – but it’s not one they needed to bother sending. The thing is, there ARE sonic delights on offer here. One listen to Out of Goodbyes, a sumptuous country/bossa nova duet with Lady Antebellum, should be proof enough that Maroon 5 know their way around the laboratory in which good pop songs are formulated better than most. How and Don’t Know Nothing boast deliciously unexpected melodic twists in their choruses: a shrugged cadence of resignation in the latter, a surprise howl to the skies in the former. You have to be good at music to do this kind of thing. Of course, there’s also a lot of evidence here that hard work, tunesmithery and competence can be a stifling influence. The Jack Johnson soul of I Can’t Lie and the big stadium balladry of Just a Feeling both suffer from a suffocating fug of quality workmanship, at the expense of any kind of personality or fun. Whereas the rude guitar sleaze of Hands All Over, or the cocky glam-stomp in Stutter’s verses show a band who are really at their best when they play pop music like the sleazy rockers they clearly are. In Adam Levine’s mind, at least.